Nutmeg is a world-renowned spice derived from the perennial tree known by the scientific name Myristicafragrans. Indigenous to the spice islands located in the Indonesian rainforest, this tree can be credited with bearing not one but two prominent spices, namely, nutmeg and mace. This cannot be said of any other tree known to man, making Myristicafragrans or the nutmeg tree quite the find. Although predominantly a tropical plant that’s grown in the Caribbean and Asia, the acclaim of nutmeg has traveled far and wide. Nutmeg, which is essentially the seed of the tree, is characterized by a delicately warm and sweet tinge, which accounts for its popular use in a wide array of culinary traditions. Even a dash of this spice can enliven your desserts, confectionaries, broths, gravies, and curries with a complex richness of taste and a pungent aroma. A nutritional profile as impressive as this justifies the continued use of nutmeg as a healing agent for thousands of years, from the ancient Egyptian to traditional European and Ayurvedic schools of medicine. It’s readily available the world over, in ground or whole form for cooking; as an essential oil that is often used as an aromatic agent in soaps, candles, and other personal care items; and as a flavoring agent for dental care products. By virtue of the dynamic and versatile health-giving properties of this spice, powdered nutmeg as well nutmeg essential oils can be used as therapeutic ingredients in a number of natural and easy-to-do remedies to combat broad-spectrum health issues. Other than being easy on our taste buds, nutmeg is generously endowed with a wealth of nourishing qualities. Don’t be fooled by its seemingly inconsequential size, for when it comes to medicinal potential, this sought-after spice packs quite a healthy punch. 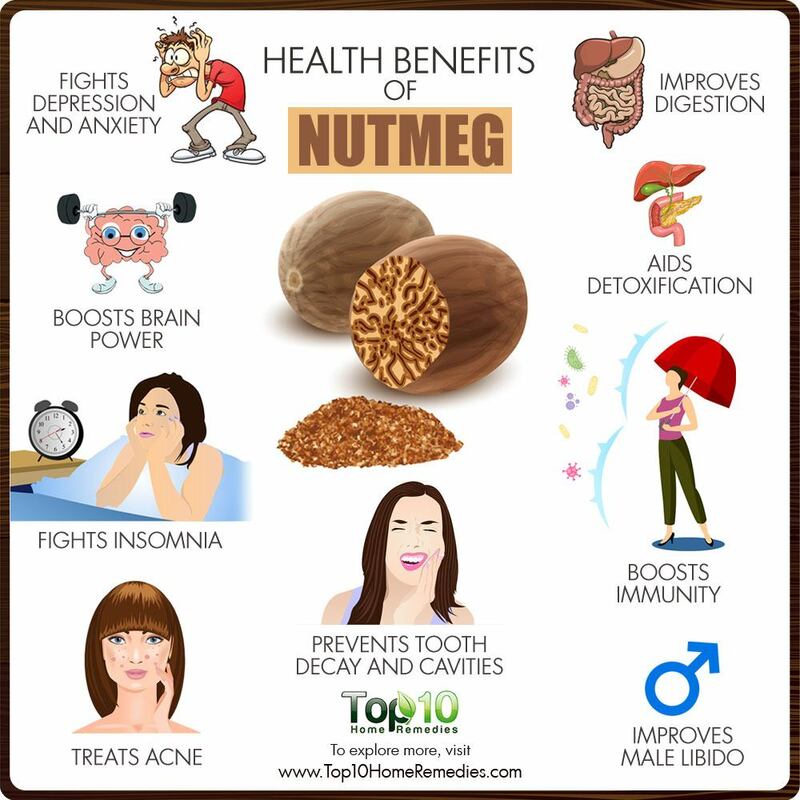 Potassium, iron, manganese, thiamin, folate, magnesium, copper, and vitamins including B1 and B6 are just some of the components that account for nutmeg’s nutritive benefits. Do not take nutmeg in excess as it can be toxic in large doses. Do not take more than ½ teaspoon a day. Excess intake can produce psychoactive effects and lead to problems such as agitation, hallucinations, and nutmeg intoxication. It can also cause side effects such as intense nausea, vomiting, diarrhea, palpitation, dizziness, and dry mouth. Store this spice in an airtight container and away from moisture, heat, and direct sunlight to avoid loss of aroma and flavor. Here are some health benefits of nutmeg. If you suffer from anxiety or depression, nutmeg is a great natural treatment. The volatile oil compounds myristicin and elemicin in nutmeg offer mild sedative and anti-anxiety benefits by activating the neurotransmitters serotonin and dopamine in the brain. It also works as an adaptogen that helps the body and mind to cope with stress. Thus, nutmeg provides the dual advantage of lowering your blood pressure in times of stress and lifting your spirits when you are feeling down. A 2012 study published in the Avicenna Journal of Phytomedicine was the first to highlight the potential antidepressant activity of nutmeg. It was found that its antidepressant-like activity maybe due to nutmeg’s modulatory effect on central monoamines. Mix a pinch of nutmeg powder in 1 tablespoon of Indian gooseberry juice. Drink this twice daily to calm the mind and relieve depression. Nutmeg can work like a brain-boosting tonic to keep your cognitive functioning at its best. There is quite a precedence in this regard with ancient Roman and Greek civilizations relying heavily on nutmeg for its neuroprotective properties. The compound called myristicin in nutmeg aids in improving memory by stimulating and preserving the neural pathways in the brain. It also improves concentration and the ability to focus. Furthermore, it inhibits an enzyme that contributes to Alzheimer’s disease. A 2009 study published in the Journal of Neuroimmunology found that black wild nutmeg offers benefits for the brain and nervous system. To ensure good cognitive health, add a pinch of nutmeg powder to 1 glass of lukewarm water. Drink this once daily before going to bed. For people grappling with lack of sleep, sleep distress, or full-blown insomnia, nutmeg can work as a natural sleep aid. Owing to its magnesium-rich composition, nutmeg helps palliate nerve tension and stimulates the release of serotonin, which in turn induces a sedative and calming effect that helps you doze off. The brain converts the serotonin into melatonin, a hormone that is widely recognized as a sleep inducer. Drink a cup of warm milk mixed with a pinch of nutmeg powder daily before going to bed. Alternatively, you can mix 2 drops of nutmeg essential oil in 2 tablespoons of olive oil and massage this on your forehead before going to bed. The anti-inflammatory and analgesic properties of nutmeg can be attributed to its inherent essential volatile oils such as myristicin, elemicin, safrole, and eugenol. Thus, this spice, as well as the oil derived from it, can be an effective chronic pain reliever for people suffering from inflammatory conditions such as joint and muscle pain. In a 2016 study published in Food and Nutrition Research, researchers injected rats with nutmeg oil to test its anti-inflammatory and analgesic effects on chronic pain. The findings confirmed the effectiveness of topical application of nutmeg essential oil to alleviate joint swelling as and mechanical allodynia, which is an intense pain brought on by even a light touch to the extent that it might even be a better healing agent than other traditional pain relievers like diclofenac. To get relief from painful joints and muscles, mix a little nutmeg oil with a carrier oil like coconut oil or olive oil and massage this oil mixture onto the affected areas a few times daily. Also, adding a little nutmeg in your cooking can help reduce inflammation and related pain from within. Nutmeg is a carminative that is good for the digestive system in more ways than one. In addition to easing common nausea, vomiting, indigestion, bloating, gas, and diarrhea, it can also aid in managing symptoms of Crohn’s disease. It helps to increase the secretion of gastric and intestinal juices, thus ensuring speedy and smooth processing of the ingested food. Also, being rich in fibers, nutmeg adds bulk to the bowels and helps them move along the intestinal passageways with greater ease, thereby preventing the common digestive discomfort of constipation. Furthermore, a 2002 study published in Methods and Findings in Experimental and Clinical Pharmacology found that nutmeg extract helped resolve diarrhea in laboratory animals as well. When suffering from digestive issues, all you need to do is add a pinch of nutmeg to your soups and stews. Nutmeg is also beneficial for your oral health because of its antibacterial properties. It’s considered a natural oral disinfectant or toothpaste, which has the potential to eliminate harmful strains of bacteria inside the mouth that are culpable for a number of dental issues, including cavities and tooth decay. Furthermore, nutmeg contains the volatile essential oil that goes by the name of eugenol, which helps mitigate toothaches. The antibacterial potency of nutmeg accords it the ability to wipe out the buildup of oral bacteria that are responsible for halitosis, also known as bad breath. No wonder then it is a commonly found ingredient in a number of oral hygiene products, such as toothpaste and mouthwashes. Simply grate some nutmeg and mix it with a little oregano oil. Use it to brush your teeth a few times a week. To fight bad breath, put a few drops of nutmeg oil in 1 glass of lukewarm water and use it as a mouthwash. Nutmeg can also give your immune system a boost. It enhances your immunity due to the presence of minerals and vitamins that contribute to its antioxidant action. Antioxidants help protect your body from free-radical damage, which can otherwise have a negative impact on your immunity and make it hard for your body to fight off illnesses. Also, nutmeg is rich in potassium, calcium, iron, and manganese that play a key role in improving your body’s immunity. A 2013 study published in the Journal of Al-Nahrain University reports that ethanol and acetone extracts from nutmeg exhibited antibacterial activity against the gram-positive bacterial species Bacillus subtilis and Staphylococcus aureus. Crust extract exhibited stronger antibacterial activity than the pulp extract. Consume a little nutmeg daily by adding it in your milk, tea, or soup to keep your immunity strong. Proper detoxification is important to ensure your body’s overall health. Much of the burden of this task falls on the liver and the kidneys. Nutmeg offers the much-needed support to these organs to ensure their optimal functioning, by reducing the toxic burden on the body. Enriched with antioxidants, nutmeg helps reduce free radical activity in the liver and activates enzymes in the liver that help remove toxic compounds. Nutmeg extracts can also prove beneficial in treating liver disorders, injuries, and inflammation. Also, the magnesium in it is required for detoxifying cells. It also helps detoxify metals from the body. 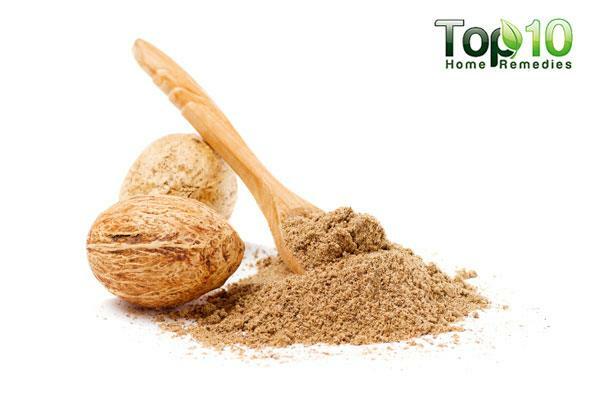 Nutmeg powder has strong antibacterial properties and thus can help treat several types of bacterial infections. On top of that, nutmeg contains a type of oil known as myristic acid, which has inhibitory effects on several types of bacteria, thereby making it even more worthwhile. In a 2006 study published in the Journal of Medicinal Food, researchers found that all of the constituents isolated from nutmeg powder exhibit antibacterial properties. Moreover, the antioxidant and antimicrobial activity of nutmeg was ascribed to a total of 32 compounds found in it by a 2013 study published in the Journal of Genetic Engineering and Biotechnology. To reap the antibacterial virtues of nutmeg, just add a pinch of nutmeg powder to 1 glass of lukewarm water or milk and drink it once daily. Moinuddin G, Devi K, Khajuria DK. Evaluation of the antidepressant activity of Myristicafragrans (Nutmeg) in male rats. Avicenna Journal of Phytomedicine. https://www.ncbi.nlm.nih.gov/pmc/articles/PMC4075663/. Published 2012. Häke I, Schönenberger S, Neumann J. Neuroprotection and enhanced neurogenesis by extract from the tropical plant Knemalaurina after inflammatory damage in living brain tissue. Plum X Metrix. 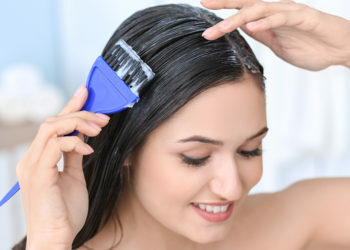 https://www.jni-journal.com/article/S0165-5728(08)00447-5/fulltext. Published January 3, 2009. Muchtaridi, Subarnas A, Apriyantono A. Identification of Compounds in the Essential Oil of Nutmeg Seeds (MyristicafragransHoutt.) That Inhibit Locomotor Activity in Mice. International Journal of Molecular Sciences. https://www.ncbi.nlm.nih.gov/pmc/articles/PMC3000115/. Zhang WK, Tao S- S, Li T- T. Nutmeg oil alleviates chronic inflammatory pain through inhibition of COX-2 expression and substance P release in vivo. Food and Nutrition Research. https://www.ncbi.nlm.nih.gov/pmc/articles/PMC4848392/. Published April 26, 2016. Grover JK, Khandkar S, Vats V, Dhunnoo Y, Das D. Pharmacological studies on Myristicafragrans–antidiarrheal, hypnotic, analgesic and hemodynamic (blood pressure) parameters. Methods and findings in experimental and clinical pharmacology. https://www.ncbi.nlm.nih.gov/pubmed/12616960. Published December 2002. Srinath J, Lakshmi. Application of Spices in Dentistry- A Literature Review. International Journal of Drug Development and Research. http://www.ijddr.in/drug-development/application-of-spices-in-dentistry-a-literature-review.php?aid=5489. Published February 25, 2014. Gupta AD, Bansal VK, Babu V. Chemistry, antioxidant and antimicrobial potential of nutmeg (MyristicafragransHoutt). Journal of Genetic Engineering and Biotechnology Journal of Genetic Engineering and Biotechnology. https://www.sciencedirect.com/science/article/pii/S1687157X12000571. Published January 23, 2013. Ugwuja EI, Erejuwa OO, Ugwu NC. Spices Mixture Containing Garlic, Ginger and Nutmeg Has Protective Effects on the Kidneys and Liver of Cadmium Exposed Rats. Advanced Pharmaceutical Bulletin. https://www.ncbi.nlm.nih.gov/pmc/articles/PMC4961988/. Published June 30, 2016. Narasimhan B, Dhake AS. Antibacterial principles from Myristicafragrans seeds. Journal of Medicinal Food. https://www.ncbi.nlm.nih.gov/pubmed/17004905. Published 2006. Nurjanah S, Putri IL, Sugiarti DP. Antibacterial Activity of Nutmeg Oil. Conference Paper. https://www.researchgate.net/publication/322976449_Antibacterial_Activity_of_Nutmeg_Oil. Published November 2017. Basic Report: 02025, Spices, nutmeg, ground. USDA Food Composition Databases. https://ndb.nal.usda.gov/ndb/foods/show/02025. Published April 2018.